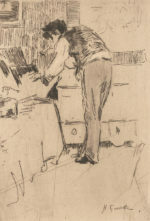 Norbert Goeneutte, Henri Guérard consulting a portfolio with prints (1876), etching in black on laid paper, 29.3 x 19.5 cm. Van Gogh Museum, Amsterdam. 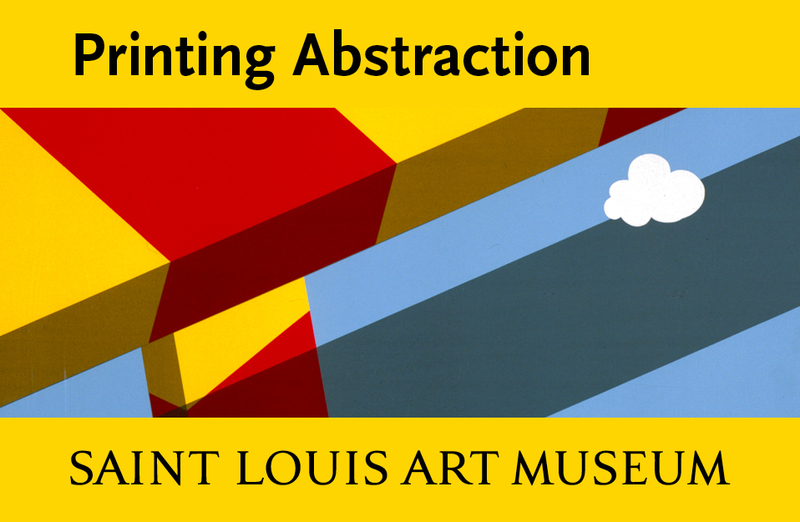 No art form lends itself as enthusiastically to collecting as does the print. It combines numismatic profusion with cultural complexity, a relatively low price point and frequent beauty. Its multiplicity creates communities (“Oh, you also own a …”) and reflects shared events and values, even while the singularity of individual impressions rewards connoisseurship and differentiation. 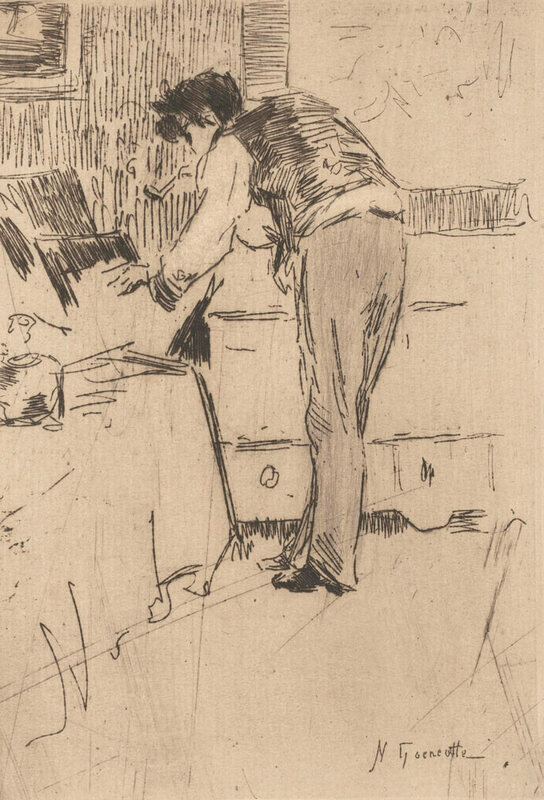 Prints may be democratic in their distribution, but unlike monumental sculpture, they ask for an intimacy of acquaintance that aligns with ownership. When Art in Print sent out a call for essays on print collecting—private or public, current or historical, personal or encyclopedic—the response was so bountiful and wide-ranging, we are devoting two issues to the theme. 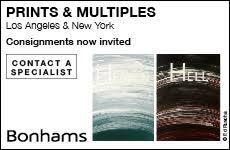 In July we will focus on collecting in North America, while this issue concentrates largely (though not exclusively) on European art. What Camille Pissarro described as the print collecting “mania” that took hold in the fin de siècle is the subject of two articles here: Catherine Bindman interviews curator Fleur Roos Rosa de Carvalho about the Van Gogh Museum’s current groundbreaking exhibition, “Prints in Paris: From Elite to the Street,” while Jillian Kruse concentrates specifically on the transformation of the poster from ephemeral advertisement to prized collectible. Sarah Kirk Hanley’s interview with Kay Wilson and Lesley Wright about Grinnell College’s art collection, and Harry Laughland’s conversation with British curator Stephen Snoddy, address the responsibilities of collecting on behalf of the public, and the specific roles that prints can play in providing historical context and aesthetic breadth. Patricia Emison links public and private, surveying the community of those who own work by one particular artist—the British etcher Norman Ackroyd. Several writers offer personal histories of their own collections, which took shape from a variety of motivations and resulted in very different outcomes. Kit Basquin examines how specific acquisitions correspond to specific chapters in her life, marking each through shifts in style, subject matter and artists. Brian Cohen writes about collecting from the vantage point of an artist who admires, analyzes and also cribs: “This is what we do: we share, we speak to each other across time and place. 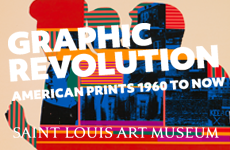 We appreciate each other and we desire the best of what each other has done.” The Goldmans chart their voyage from the burgeoning print scene of the 1960s, through the careful construction of a definitive body of German Expressionist prints, to a renewed emphasis on contemporary art. Perhaps most unusual is Jennifer S. Pride’s account of using eBay to acquire the subject matter of her doctoral dissertation on 19th-century pictorial commentary on Baron Hausmann’s transformation of Paris. By luck, the winner of this issue’s Prix de Print, selected by Paul Coldwell, is a collection in itself—Cooper Holoweski’s Recent Antiquities (2016) adapts eight plates from Giovanni Battista Piranesi’s 18th-century Antiquities of Rome (also a kind of collection) and recasts them with more recent abandoned artifacts, from shattered CDs to shuttered Circuit Cities. Neither of the exhibitions covered in this issue—a Texas screenprint installation by the Berlin duo Resurgo (reviewed by Jason Urban) and the majestic Hercules Segers show at the Rijksmuseum and the Metropolitan Museum of Art (reviewed by Robert Fucci)—are overtly about the impulse to collect, yet both have things to say about the human urge to preserve, our persistent habit of using objects as a bank against the flood of time. “Every passion borders on the chaotic,” Walter Benjamin wrote, “but the collector’s passion borders on the chaos of memories.”3 Each item in a collection is wrapped in personal recollections and also tied to the other things on the shelf, on the wall, in the drawers. Think of it like epigenetics—a changeable code written over a permanent one, with an accumulation of knock-on effects. Writing in 1931, Benjamin suspected that serious, personal collecting was becoming a thing of the past. About this, he was very wrong.